The company: Smallbone cabinetry has been built by craftsmen trained in the traditional skills of turning and joining, for the last 38 years. The company prides itself on revolutionising the traditional purpose of the kitchen from cooking space to today’s social hub. Founded in 1978, Smallbone was the first company to offer traditional farmhouse-style kitchen collections with unique and inspirational designs in natural timber and hand painted finishes. More recently, Smallbone has introduced contemporary collections such as the Brasserie, Macassar, and the Walnut & Silver kitchens. Smallbone has also been chosen for its ability to design and create bespoke handcrafted collections for landmark buildings, such as ONE57 and Walker Tower in New York. ‘The house is Georgian, built in 1820 and is a four-storey granite building, with a pair of white classical pillars flanking the front door. Our Macassar Collection was a natural choice. The inspiration for this exquisite design comes from one of Britain’s greatest architects, Sir John Soane. His mastery of space and light, and commitment to craftsmanship, have been interpreted to create a kitchen that blends classicism with cutting-edge design’. Q: What was your brief from the client? The brief given to Smallbone was quite detailed as the client had lived in the house for four years and had already developed an accurate idea of what she wanted to meet her needs, and what would work within the space available. As the house is a Grade B listed building the design had to be sympathetic to the property and respect the associated restrictions. Q: How did you set about answering that brief? The room has very high ceilings and large, beautiful windows which were a key aspect of the design. The perfectly symmetrical run of furniture along the right hand wall houses a freezer at one end and a refrigerator at the other. 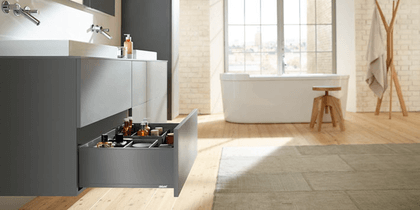 A large sink with a double drainer is positioned centrally with waste bin and dishwasher either side. The glazed walls cabinets with mirrored backs are perfect for storing glassware and china. The cooking zone on located on the opposite wall features bottle racks to keep spices and oils close at hand. The island is ideal for prepping and plating up and has a well-placed seating area where friends and family can gather. Smallbone also created unique windows seats to make the most of the stunning views. Q: Which products did you use and why? The Macassar collection combines the finest materials favoured by architect Sir John Soane, such as mirror, glass and marble, which are used in highly creative and imaginative ways. Mirrored slips set within doors create an impression of light and space and offer perspectives on the kitchen furniture from every viewpoint in the room. As previously mentioned, there were limitations as the house is Grade B listed. However, the room had been partitioned many years ago to create a dining room and separate small kitchen and permission was given to remove the partition, returning the room to its original dimensions. Q: What elements do you think make the scheme so successful? Firstly, the finished kitchen is very glamorous and has become a great place to cook and relax whilst also paying homage to the property’s Georgian heritage. Secondly, the beautiful graining of the veneered panels and polished nickel handles give the room an elegant furnished look which is perfect for anytime of the day. Q: Any advice for someone who may be planning a new kitchen? As with this project, it is great if you can actually spend time the kitchen to really visualize how the space works, and how you would like to use the space. Work with a sympathetic designer who takes the time to understand how you live and can translate your vision into reality. Build a scrapbook of features, colours and appliances you like, to create a great starting point. A bespoke cabinet maker will be able to work with you to ensure the kitchen suits your individual lifestyle and is also appropriate to the property. Work surfaces in Kashmir White Granite, all by Smallbone of Devizes.